Home / De Original Jamaican Pattie Shop and Juice Bar / Food / Local Places / De Original Jamaican Pattie Shop and Juice Bar is Ya Mon Delicious! 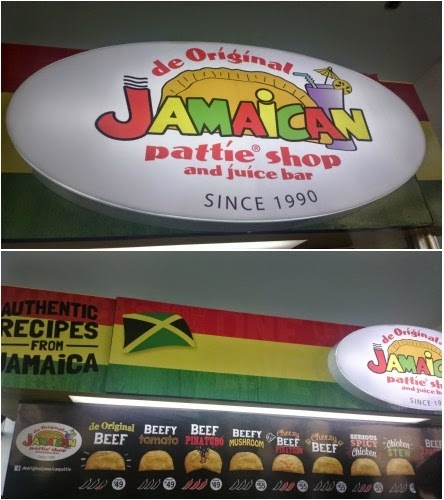 De Original Jamaican Pattie Shop and Juice Bar is Ya Mon Delicious! Being a foodie, I’m in a quest always for the best food everywhere I go and I’ve discovered a recent delicious addition to the list of delectable dishes worth featuring. It’s through De Original Jamaican Pattie Shop and Juice Bar! One look and you might mistake the displayed snack for an empanada but once you’ve had a taste, you’d realize that it’s so much better than the usual wrapped food. Try their best seller, the cheesy beef to taste what I’m talking about. If you’re into spicy food though, the beef Pinatubo is the spiciest in their menu. For a complete list of the menu, branches, and franchise information, see www.facebook.com/deoriginaljamaicanpattie. Posted by Maria Marilyn, more foodies at Pinterest.